My nerd is showing because Y’ALL — I’m talking about food. I love food. I think that’s one of the reasons I love every single thing about Shauna Niequest — she is a Christian/mom/wife/superstar who also loves food. She’s written on and on about the balance between body acceptance and the richness and pleasure in eating well, and that is a line I tread regularly. Food is spiritual. Whether we are filling our children’s bellies or bringing a dish to a family in need, we are doing God’s work. The kind of food doesn’t matter as much as the feeling behind it. Before I start getting a bit too dramatic, please know that there are many times I stand, bleary-eyed, in front of the microwave reheating boxed macaroni and cheese for my children. In that moment, my motivation may simply be “feed the kids quick,” but when I reflect on those times, I know that I am still providing for them in a real and tangible way. LIFE, y’all. I know it’s hard to break out of the mealtime madness routine. Our lives are busy and full, and sometimes the thought of standing in a kitchen and making a big mess and chaos is just less than desirable. But if you are like me, you know that a delicious meal can, if only for a moment, soothe and comfort. I do not claim to be any sort of food or meal prep expert, but I am premeditated, and I’m going to share some goodness with you. This week I’m talking about basic tips and how-to’s, but next week I’ll be talking about my favorite appliances (like the star-of-the-hour, the INSTANT POT!). Premeditated Meals in 5 Easy Steps! A fun meal prep notebook is a total game changer. Even if you aren’t a big planner, please please plan out some meals. 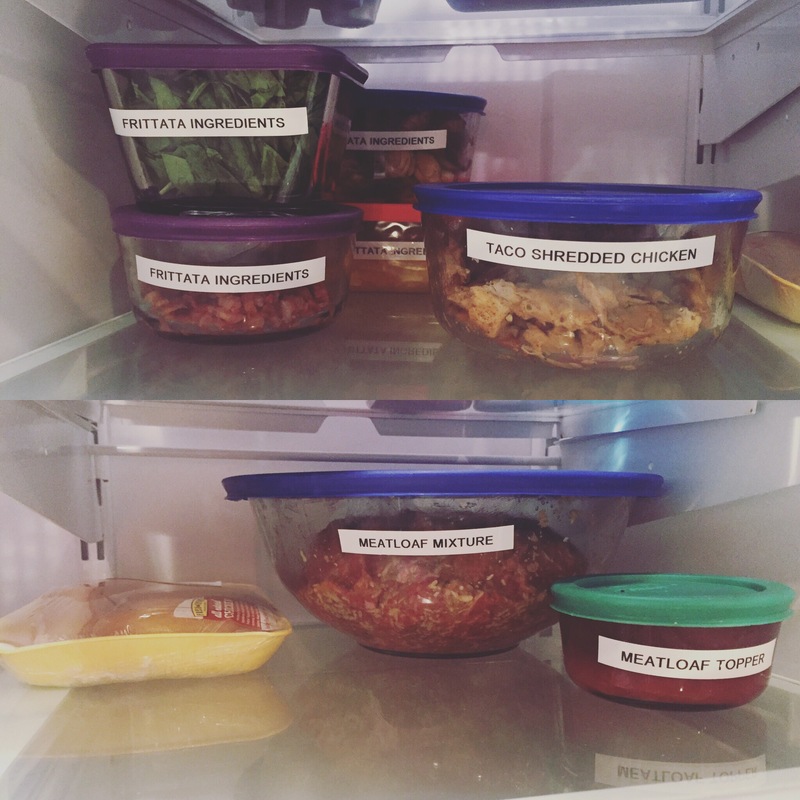 Start with dinners if you are new to meal planning — I plan out dinners for each day (though sometimes they do get shuffled around) and a few breakfasts and lunches for the week. I use a magnetic notebook and leave it on my fridge so I always know what meals we’ll be eating on a given day. Some caveats here: yes, there are a million videos/articles/blogs on the internet that will tell you how to store your veggies. Usually these won’t say “cut them all up!” because this will sometimes cause them to go bad quicker. Know how many veggies you’ll eat in a week and buy/prep that much only. You’ll be much more likely to eat it if it’s ready to go anyway, and couldn’t we all eat more easy veggies? We could. If the idea of making all of those snack baggies makes your earth-loving heart cringe, look into reusable cloth snack bags. I do like the cloth bags I have, but if I’m being honest, I use ziplocks a lot. We are a people who lose things. A happy little chicken pot pie all ready for the oven! Hopefully, your meal prep will make the cooking EASY. Throwing salads together, reheating taco meat, or throwing a bag of ready-t0-go food into a slow cooker. It’s hard to feed your people everyday. Make this as simple as possible. Perhaps this goes without saying, but hey, eat your food. Really eat it. Sit down at the table, pour yourself a glass of wine or La Croix, pray with your family, eat with your family. Take the time to be present, because life comes at you fast. And your food will taste better if you, ya know, sit and chew it. That’s all for today. Happy meal prep! Check back on Thursday for my favorite kitchen stuff! take some food to my neighbors. We have new neighbors in two houses in our neighborhood and I have not reached out to welcome them. Where can I get the magnets for the fridge?